In Glendale, Arizona, $77,600 was used to assemble and distribute safety and educational materials to all local elementary schools, libraries, and youth organizations. 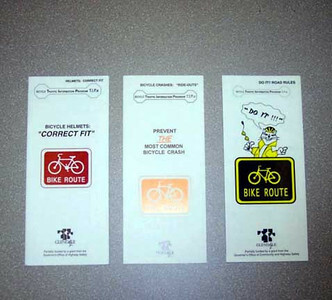 The comprehensive bicycle education program includes materials for teachers and youth leaders to teach 8-13 year olds about bicycle safety. These Bike Boxes included a step-by-step trainers manual, instructional equipment, safety videos, a bicycle helmet, childrens worksheets, and more. The project was sponsored by the City of Glendale and the project received the Golden Spoke Award for the 2004 Valley Metro Clear Air Campaign.